Seen are, from left, are Sandra Crouch, Tommy Higgins, Connie and Jimmy Higgins, Erin Fann and Jamie Higgins. About eight members of the Higgins family keep things running smooth at the drive-in. Munching popcorn, baby boomer Donna Houston lounged in a lawn chair on a recent Friday evening, eagerly anticipating the double feature to begin at Woodbury's Moonlite Drive-In. "I haven't been to a drive-in since the '70s. I didn't even know there were still drive-ins around," said Houston. "When I found out there was one here, I got excited." Houston was being treated to her first night at a drive-in in four decades courtesy of her son Scott Parker of Murfreesboro, who also brought his daughter, Megan, 7, making it a three-generation night at the movies. "Megan's never been to a drive-in. I thought I'd bring her here to watch 'Epic,'" said Parker, whose entertainment experience parallels that of hundreds of folks who were watching films from their cars or sitting in lawn chairs in the back of their pick-up truck beds, the majority of the patrons being families. "We draw a world of people from Murfrees-boro, Smyrna, Nashville, Manchester and McMinnville," said Jimmy Higgins, 70, who has entered his eighth years of operating the Moonlite with his family that includes wife Connie, son Tommy, Tommy's girl-friend Sandra Crouch, grandson Jamie Higgins, granddaughter Erin Fann, mother-in-law Charlene Ary and cousin Judy Goff. Seven other employees from the Woodbury area also lend a hand. The Moonlite Drive-In offers twin screens with double features on Friday and Saturday nights and solo films on Sundays. The lot can handle 500 vehicles and held about 1,250 patrons on a recent Saturday night. The spacious indoor conces-sion stand offers air-conditioned seating for those wishing to escape the late afternoon heat as well as plenty of friendly concession help from workers bedecked in colorful, tie-dyed Moonlite T-shirts. Higgins and his sons erected the 70-by-35-feet and 60-by-32-feet screens themselves to save thousands of dollars in expenses, but he faces a big dilemma before summer's end. Hollywood film studios will quit turning out their products in 35-millimeter projection this month, thus if theaters do not convert to digital projection by August, they will not be able to show movies. As the Los Angeles Times reported in January, "Hollywood is expected to stop distributing 35-millimeter film prints to all U.S. theaters later this year. The vast majority of indoor theaters-hardtops, in drive-in lingo-have already converted to digital projectors, but 90% of drive-ins have not, according to an industry trade group. Conversion costs of $70,000 or more per screen could be too expensive for many drive-ins." While the Moonlite still projects 35-millimeter, Higgins seems prepared to bite the bullet, saying, "Whatever we have to do, we'll do. It's gonna cost about $150,000 to change." There's no doubt about it, the drive-in picture show has come a long way since Richard Hollingshead Jr. opened the original in Camden, N.J., on June 6, 1933. His drive-in offered 400 parking spots and a 40X50-foot screen. Hollingsworth advertised his business using the slogan, "The whole family is welcome, regardless of how noisy the children are." And families pack the Moonlite every weekend just like Murfreesboro's David Bramble who was here with wife Christy and children Baylor, 14, Macie, 10, and Brady, 8, where they enjoyed chicken fingers and cheese nachos before "Epic" and "Iron Man 3" went up on the big white screen. "This is our second time here," said Bramble. "We came because it was good weather, and it's not going to be hot tonight. This is a family event and did not cost too much money." Danny and Summer Brashears of Murfreesboro also enjoy watching movies in the great outdoors after the sun goes down and say they make the drive about 10 times a year. "One of the things we love about coming over here, you can't beat the prices. We don't ever go to a normal movie theater," said Summer. The pair, who wed last August, had their second date here back in 2010. "That's when I knew I was gonna marry her. We sat here for three hours before the movie. The sun just didn't want to go down. We sat in the back of my truck and really got to know each other. We've been coming back ever since," Danny said. 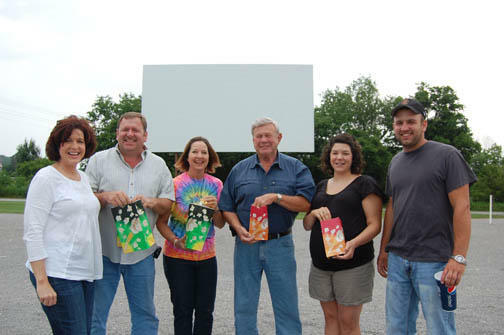 Higgins, a businessman and farmer, was inspired to open the drive-in after going to the Sparta Drive-In with Connie eight years ago, about the same time they had purchased the property that the Moonlite occupies. "I had never seen as many families," recalled Higgins. "I told Connie, 'That's what we'll do down there with the land we just bought.' We came home and I started looking around at other drive-ins. We drawed our blueprint on a napkin and that's how we built it, with no specs or nothing." He hired local carpenters Chris Underwood and Thomas Stembridge to construct the concession stand, and, voila, the Moonlite was ready for business. "Seeing the people is really fun. And the workers are our family, and we get to be together every week. Every bit of our family just about is involved with the drive. I enjoy working with lots of friends from church," said Connie, who handles the register in the concession stand among other chores. She confesses that she only gets to watch about three or four movies a summer. "What I really like to do is work in the ticket booth and have friends from church come, and we sit outside the ticket booth and watch the movie, too. That's the real treat for me." Jimmy, who has yet to watch a movie this year, said he also enjoys working side by side with his wife, children and grandkids, plus, "It makes a little money. It's paid for itself." He gives son Tommy, the projectionist, credit for overseeing most of the business. Not subject to laziness, Jimmy moonlights at the Moonlite cooking burgers and making pizza. During daylight hours, he and his family operate two car washes, run a flea market, rent storage space, farm 1,800 acres of corn, beans and wheat, raise 650 cattle and develop land. His penchant for hard work goes back to his childhood. When he was 9 in 1952, he and his two brothers sold geodes along Highway 70 in the Leona community. "We took some old planks and made a rock stand out by the highway so people could pull off the road and buy our rocks from a nickel to a dollar," said Higgins, who, with the Moonlite Drive-In, continues to persuade motorists to stop at his business on the side of Highway 70. When: Friday, Saturday and Sunday: Box office opens at 6 p.m.; first movie starts at dusk; single feature only on Sundays. Food policy: Outside food and beverages prohibited.